Lush Fab Glam Inspired Lifestyle For The Modern Woman: Five Steps To An Organized Home. Five Steps To An Organized Home. 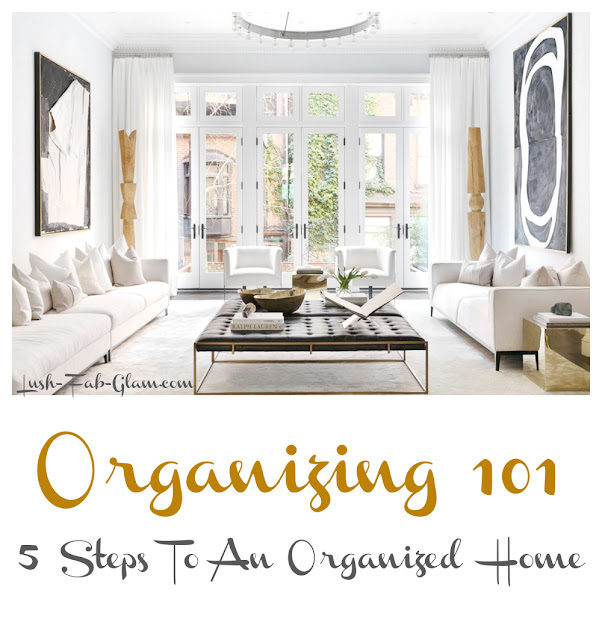 ﻿Organizing 101: 5 Easy Steps To An Organized Home. Is getting organized one of your new year resolutions? If so, you'll be thrilled with our Organizing 101 Series where we'll be sharing tips to help you create and embrace a minimalist lifestyle. First up is our 'five easy steps to an organized home' article. Read on to learn how to prepare for the task at hand, effectively de-clutter and properly store away items. As well as how to keep the rooms in your home organized and clutter-free all year round. Plus see our recommendations for must-have organizing essentials. Step 1. Make A List of the rooms/ spaces that you would like to organize: We recommend starting with the smallest room with less clutter first, since it will be the easiest to finish up and the aftermath will encourage you to continue and help build momentum for organizing additional rooms. Step 2. De-clutter by creating a toss, keep and donate pile. There is no time like the present to get rid of unused, unwanted, old or expired items. Whether you choose to sell some used items that are still valuable or donate them, having a clutter free space will be worth the effort. Step 3. Give your space a mini-makeover by dusting, disinfecting and cleaning up: There is no point in organizing things unto dirty shelves, closets and floors, so do clean up first. A fresh coat of paint will also help to refresh your space, apply if needed. Step 4. Purchase storage essentials Now that you know which items you want to keep, it will be easier to figure out what storage essentials you need (like shelves, storage furniture, baskets, containers, bins, jars and household labels ) to keep your things organized and you can set a proper budget to purchase them. Step 5. Once you've created additional storage space by de-cluttering and purchasing the necessary storage items items, it;s time to have fun organizing your things into baskets, bins and shelves etc. Don't forget to organize based on categories, color coordinate for aesthetic purposes and store based on usefulness, keep your most used items where they can easily be seen and reached. Labeling your storage essentials will also help you to easily locate things. Bonus Tip: Keeping your space organized can be easy if you simply put things away immediately after you are done using them. You should also take advantage of seasonal timelines that build momentum for organizing like spring cleaning and pre-winter sprucing up and don't forget to include organizing in your goals for the new year so you can keep your home clean, clutter-free and well organized through-out the year. Happy Organizing! More fab organizing tips coming soon. Subscribe to our email newsletter so you don't miss out on our next article in the Organizing 101 Series.